The entrepreneurial ecosystem (startups, business angels and corporations) counts the days until the start of South Summit 2018 the upcoming 3rd till 5th of October in Madrid and we too! Signaturit participates again in this edition, and once again, by the hand of BStartup, an initiative of Banco Sabadell that has been sponsoring this event since the first edition. If you are going to be in Madrid between the 3rd and the 5th of October and you are interested in knowing the main actors and strategies in terms of innovation, come and see us! Why attend the South Summit 2018? 'Innovation is business' is the title of this year's South Summit where the most disruptive projects will meet in Madrid at a meeting organized by Spain Startup and IE University in collaboration with BBVA, Endesa, Wayra, Sabadell and Google. Signaturit will be present again this 2018 after participating in the last three editions and in particular after the success of last year, with 12.500 attendees from 100 countries. For this occasion it is expected that more than 175 international investment funds will attend with a portfolio of more than 55,000 million dollars, 60% higher than that of South Summit 2017. For these reasons throughout the day of Thursday, October 4 and Friday 5 until 14.00pm we will have a booth within the BStartup corner, where we will be happy to assist all those who have interest in knowing what our electronic trust services are capable of in order to make any possible type of online transaction. Specifically in Signaturit we develop intuitive technological solutions and with full legal guarantees that are part of the so-called trust services: electronic signature, certified email (the equivalent of the old burofax) and electronic identification. 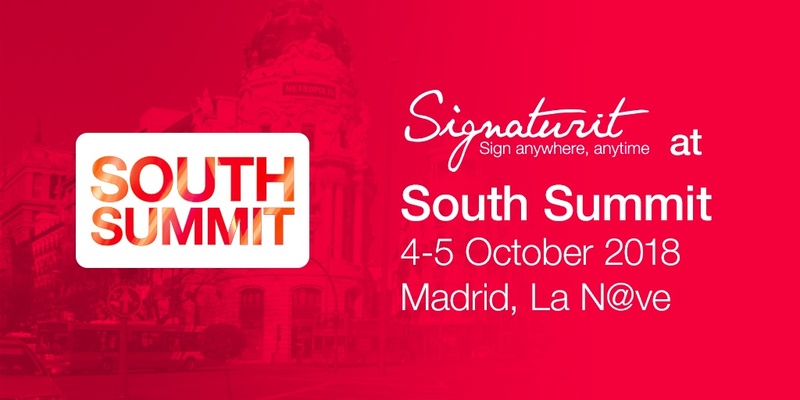 If you want to know how our trust services serve to guarantee the security and give legal validity to your electronic communications, independently of the sector in which your company operates, and to know our next projects based on Blockchain, don't hesitate to visit us at South Summit! 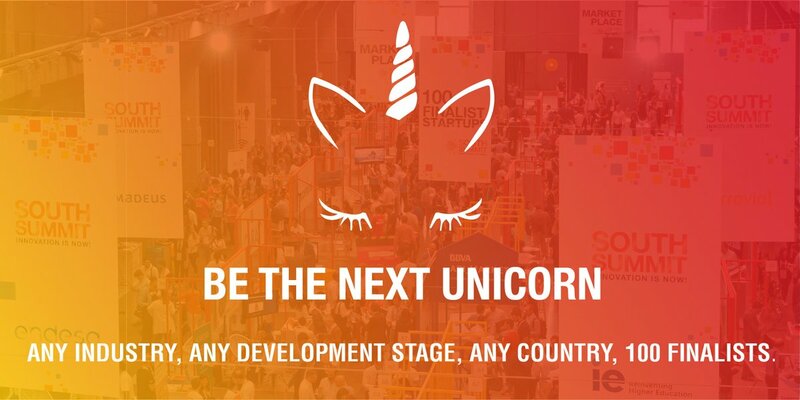 South Summit is the leading global innovation platform focused on business opportunities that brings together the main players of the entrepreneurial ecosystem. In particular, it connects the main innovators of southern Europe and Latin America with the most powerful investors and companies in the world. In particular, more than 3,500 startups and around 650 investors will attend with the aim of showing the world the best talent and supporting the entrepreneurial network that has to contribute to the global economy. Among the new funds that will visit Madrid for the first time are BlackFin Capital Partners, Thrive Capital, Target Global, Beringea or Atlantic Bridge Partners. In addition, in this edition highlights the presence of funds from some companies that have Corporate Venture Arm as Samsung Ventures, Evonik Ventures, Axa Venture Partners, Rabo Frontier Ventures, APX Axel Springer Porsche GmbH & Co. KG or Inmotion Ventures. "Prosperity is a direct consequence of innovation"
Within this exclusive event, an agenda has been structured around 188 sessions between conferences, lectures and debates in which will participate consolidated entrepreneurs, investors, long-distance entrepreneurs and world-renowned experts in technology, business and innovation. Fintech, Data, Blockchain, Cybersecurity, Inspirational are some of the labels with which we can define these meetings that will be developed along 7 different scenarios during the 3 days in which the event takes place. To give some examples of the level of the 200 confirmed speakers, the participation of the Amazon vice president, Paul Misener, has been announced; Jeanette J. Epps, a well-known New York astronaut from NASA; Nikolay Storonsky, founder and CEO of Revolut; Oscar Pierre, founder and CEO of Glovo and previously founder of the platform Zikkomo and LoveItLocal.es; Lukasz Gadowski co-founder of Delivery Hero. As every year, within the framework of the South Summit a competition is held among 100 startups selected globally between different industries. The prize, to which all aspire, is to obtain an investment of $ 1,000,000 in Silicon Valley to be the next Unicorn. The 100 finalists will present their project in 3 minutes on stage corresponding to their track. Once the winners of each vertical have been chosen, the 10 finalists will once again present on the main stage, competing to become the winner of the South Summit 2018 or opt for the award of "Best Team", "Most Scalable Startup" or "Most Disruptive Startup. " Where: La N@ve in Madrid, a space for innovation and new technologies, designed ad hoc for meetings of innovation and entrepreneurship such as South Summit. Stand: Our stand will be at the startup stand of Sabadell - Bstartup. This project has received funding from the European Union’s Horizon 2020 research and innovation programme under grant agreement No 778550.